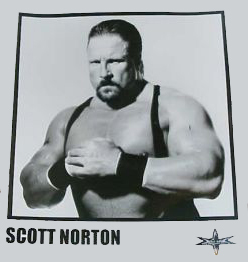 History: Scott Norton first made himself well-known with his arms. A former World Arm Wrestling Champion, Norton got the nickname Flash by winning matches quickly. He became a wrestler in 1988, mostly wrestling in the NWA Pacific Northwest. In May 1990, Norton won the NWA PNW Heavyweight Title from Brian Adams. He was later forced to vacate the title due to his attacks on other wrestlers. Norton truly became well-known when he began wrestling in Japan. He became a main attraction, with his brute strength and surprising speed. In November 1992, he teamed with Tony Halme to win the I.W.G.P. Tag Team Championship, defeating the Steiner Brothers. Less than a month later, they were defeated by the Hell Raisers. After some more singles wrestling, Norton teamed up with Hercules Hernandez to form the Jurassic Powers. The team won the Tag-Team belts from the Hell Raisers in August 1993, and held them for about 5 months before the Hell Raisers took the belts back. Norton wrestled in Japan for another couple of years, but did not obtain any more gold there. In 1995, Norton came to WCW. He teamed with Ice Train, but the two never managed to get any gold there. When the nWo was formed, Norton immediately joined, leaving Ice Train behind. Norton became one of the structural builders of nWo, being credited with the formation of nWo Japan. He also teamed with Marcus "Buff" Bagwell numerous times as Vicious 'N' Delicious, until Bagwell's neck was injured in 1998. Norton then became simply a singles wrestler, destroying opponents with the powerbomb. Despite his dominating strength and skills, however, Norton did not receive much of a push in WCW. Norton then started to wrestle for nWo Japan again. In September '98, Norton surprised some, winning the IWGP World Title over Yuji Nagata, when it was vacated by Masahiro Chono. Norton retained the belt for over 3 months before losing it to Keiji Mutoh (The Great Muta) at the beginning of '99 at the Tokyo Dome. 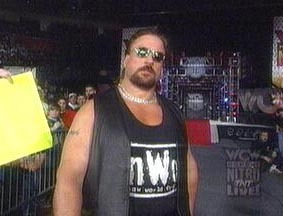 Norton proved himself worthy of greater things, but still returned to WCW as a Team "B" member of the black 'n' white, appearing infrequently alongside Stevie Ray and the rest. The Monster had a brief feud with Ernest "The Cat" Miller, usually coming into the ring and destroying the 3-time karate champion. Although the feud got him some recognition, Norton wasn't moving anywhere. When the nWo "B" Team finally fell apart around the middle of '99, Norton disappeared from WCW. Norton then returned to his old stomping grounds at New Japan Pro Wrestling, trying to build his way back up to the IWGP World Heavyweight Title. He defeated Kensuke Sasaki in March '01 to reach his goal, winning the strap for the second time. After a month's reign, Norton was beaten for the championship by Kazuyuki Fujita. He now looks to regain the belt for a third time in the future, earning far more acclaim in Japan than he ever did in WCW. - AWA War In The Wicked City (June '89) = Norton & Ken Patera beat the Destruction Crew. - NJPW Sumo Hall (December '90) = Norton pinned Tatsutoshi Goto. - NJPW Tokyo Dome '91 (Starrcade in Egg Dome) = Norton defeated the Equalizer. - NJPW Sumo Hall (April '91) = Norton managed to take out Keiji Mutoh. - NJPW Budokan Hall (June '91) = Norton was pinned by Big Van Vader. - NJPW G1 Climax '91 (August 7-11, '91) = Norton competed in the tournament, which was won by Masa Chono. - NJPW Sumo Hall (August 9, '91) = Norton lost, via countout, to Big Van Vader. - NJPW Sumo Hall (August 10, '91) = Norton and Tatsumi Fujinami fought to a Double Countout. - NJPW Sumo Hall (August 11, '91) = Norton, Bam-Bam Bigelow & Big Van Vader defeated Kensuke Sasaki, Tatsumi Fujinami & Hiroshi Hase. - NJPW Super Grade Tag League I (October 5-17, '91) = Norton & Shinya Hashimoto competed in the League, which was won by Tatsumi Fujinami and Big Van Vader. - NJPW Budokan Hall (November '91) = Norton (who was substituting for Scott Steiner) & Rick Steiner lost the IWGP Tag-Team Titles to Keiji Mutoh & Hiroshi Hase. - NJPW Tokyo Dome '92 (Starrcade in Egg Dome) = Norton was beaten by Tony Halme. - NJPW Sumo Hall (April '92) = Norton & Tony Halme fell to Riki Choshu & Shinya Hashimoto. - NJPW Budokan Hall (June '92) = Norton & Killer Bee lost to Samu & Kokina. - NJPW G1 Climax '92 (August 6-12, '92) = Norton defeated Bam Bam Bigelow, then lost to Masa Chono, who went on to win the vacant NWA World Title. - NJPW Sumo Hall (August 11, '92) = Norton & Bam-Bam Bigelow defeated Tony Halme & Barry Windham. - NJPW Sumo Hall (August 12, '92) = Norton, Bam-Bam Bigelow & Tony Halme won over Jim Neidhart, Barry Windham & the Barbarian. - NJPW Super Grade Tag League II (October 8-21, '92) = Norton and Super Strong Machine competed in the League, which was won by Riki Choshu and Shinya Hashimoto. - NJPW Sumo Hall (November 22, '92) = Norton & Tony Halme defeated the Steiner Brothers to win the IWGP Tag-Team Titles. - NJPW Sumo Hall (November 23, '92) Norton & TNT took out Tony Halme & Ron Powers. - NJPW Tokyo Dome '93 (Fantastic Story) = Norton and Dustin Rhodes lost to Masa Saito and Shinya Hashimoto. - NJPW Wrestling Dontaku '93 = Norton fought to a Double Disqualification with Sting. - NJPW Sumo Hall (August 5, '93) = Norton & Hercules Hernandez won the IWGP Tag-Team Titles from the Hellraisers. - NJPW Sumo Hall (August 6, '93) = Norton & Hercules Hernandez retained the IWGP Tag Titles, beating Manabu Nakanishi & Masa Saito. - NJPW Sumo Hall (August 7, '93) = Norton & Hercules Hernandez kept the IWGP Tag Titles, defeating Haku & the Barbarian. - NJPW Sumo Hall (August 8, '93) = Norton & Hercules Hernandez won, via DQ, over the Hellraisers, staying the IWGP Tag-Team Champions. - NJPW Sumo Hall (November '93) = Norton & Hercules Hernandez beat Sean Royal & the Barbarian, but lost in the Finals of the Super Grade 1994 Tag League to Keiji Mutoh & Hiroshi Hase. - NJPW Tokyo Dome '94 (Battlefield) = Norton & Hercules Hernandez lost to IWGP Tag Titles to the Hellraisers. - NJPW Budokan Hall (June '94) = Norton & Mike Enos were beaten by Keiji Mutoh & Masa Chono. - NJPW Sumo Hall (August 4, '94) = Norton & Hercules Hernandez fell to the Steiner Brothers. - NJPW Super Grade Tag League IV (October 19-30, '94) = Norton & Osamu Kido competed in the League, which was won by Keiji Mutoh & Hiro Hase. - NJPW Sumo Hall (October 30, '94) = Norton & Ron Simmons lost to the Steiner Brothers. - NJPW Tokyo Dome '95 (Battle Seven) = Norton was beaten by Hawk of the Road Warriors. - NJPW Sumo Hall (February '95) = Norton lost to the IWGP Champion, Shinya Hashimoto. - NJPW Pyongyang Sports Festival (April 28-29, '95) = Norton fought the IWGP Champion, Shinya Hashimoto, to a draw. The next night, Norton and Masa Chono defeated Akira Nogami and Takayuki Iizuka. - NJPW Wrestling Dontaku '95 = Norton and Hawk lost to the Steiner Brothers. - NJPW Sumo Hall (August 11, '95) = Norton was pinned by Shinya Hashimoto. - NJPW Sumo Hall (August 12, '95) = Norton defeated Hiroyoshi Tenzan. - NJPW Sumo Hall (August 13, '95) = Norton beat Kensuke Sasaki. - NJPW Sumo Hall (August 14, '95) = Norton lost to Keiji Mutoh, eliminating him from the 1995 G-1 Climax tournament. - NJPW Sumo Hall (August 15, '95) = Norton & Masa Saito defeated Kensuke Sasaki & Tadao Yasuda. - WCW World War III '95 = Norton competed in the "3 Ring Battle Royal", which was won by "Macho Man" Randy Savage. - NJPW Tokyo Dome '96 (Battle Formation '96) = Norton and the Steiner Brothers were beaten by Power Warrior and the Road Warriors. - WCW Slamboree '96 = Norton and Ice Train defeated Big Bubba and Stevie Ray. Later in the night, after they were given a "bye", Norton and Ice Train wrestled in the Battle Bowl, which was eventually won by Diamond Dallas Page. - WCW Great American Bash '96 = Norton and Ice Train lost to the Steiner Brothers. - WCW Bash At The Beach '96 = Norton and Ice Train lost to the Rock-n-Roll Express in a dark match. - Hogg Wild '96 = Norton forced Ice Train to submit. - WCW Fall Brawl '96 = Norton lost a "Submission" Match to Ice Train. - NJPW Japan/US All-Star Tournament (September 19-23, '96) = Norton defeated Riki Choshu and Hiroyoshi Tenzan, but lost to Kensuke Sasaki, who went on to win the Tournament. - NJPW Super Grade Tag League VI (October 13 - November 1, '96) Norton and Shinya Hashimoto beat Keiji Mutoh and Rick Steiner in the Finals to win the League. - WCW World War III '96 = Norton competed in the "3 Ring Battle Royal", which was won by the Giant. - WCW Clash of the Champions XXXIV (January '97) = Norton lost to Eddie Guerrero. - WCW/nWo Souled Out '97 = Norton won via countout over Diamond Dallas Page. - NJPW Sumo Hall (February '97) = Vicious and Delicious (Norton & Buff Bagwell) & Masa Chono beat Riki Choshu, Kensuke Sasaki & Tadao Yasuda. - NJPW Strong Style Evolution (May '97) = Vicious and Delicious defeated Lex Luger and the Giant. - NJPW Sumo Hall (August 1, '97) = Norton took down Junji Hirata. - NJPW Sumo Hall (August 2, '97) = Norton won over the Great Muta. - NJPW Sumo Hall (August 3, '97) = Norton was eliminated from the 1997 G-1 Climax Tournament by Kensuke Sasaki. - WCW Road Wild '97 = Vicious and Delicious lost to Harlem Heat. - WCW Fall Brawl '97 = Norton was defeated by the Giant. - NJPW Final Battle Hall (November '97) = Norton, Michiyoshi Ohara and Hiroyoshi Tenzan won over Satoshi Kojima, Tadao Yasuda and Manabu Makanishi. - WCW Starrcade '97 = Norton, "Macho Man" Randy Savage, and Vincent defeated Ray Traylor and the Steiner Brothers. - WCW/nWo Souled Out '98 = Vicious and Delicious, with Konnan, lost to Ray Traylor and the Steiner Brothers in a 6-Man Tag Match. - NJPW Budokan Hall (February '98) = Norton took out Kensuke Sasaki. - WCW Road Wild '98 = Norton was involved with a Battle Royal, with Kevin Nash, Sting, Lex Luger, Konnan, Bill Goldberg, Scott Hall, Curt Henning, and the Giant. Goldberg was the winner. 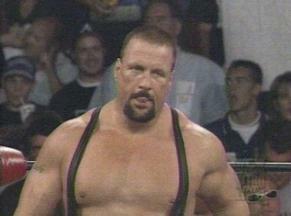 - WCW World War III '98 = Norton competed in the "3 Ring Battle Royal", which was won by Kevin Nash. - WCW Starrcade '98 = Norton and Brian Adams defeated Jerry Flynn and Fit Finley. - NJPW Tokyo Dome (January '99) = Norton lost the IWGP Heavyweight Title to Keiji Mutoh. - NJPW St. Valentine's Day Massacre '99 = Norton pinned Masa Saito. - NJPW Budokan Hall (September '99) = Norton and Keiji Mutoh won the G-1 Tag League '99 by defeating Yuji Nagata and Manabu Nakanishi. - NJPW Tokyo Dome (October '99) = Norton and Satoshi Kojami were beaten by Don Frye and Masa Chono. - NJPW Tokyo Dome (January '00) = Norton defeated Don Frye. - NJPW Sumo Hall (February '00) = Norton was pinned by Shinya Hashimoto. - NJPW Dome Impact (April '00) = Norton lost to Manabu Nakanishi. - NJPW Budokan Hall (June '00) = Norton, Satoshi Kojima, & Hiroyoshi Tenzan beat Kenzo Suzuki, Shiro Koshinaka, & Junji Hirata. - NJPW Do Judge! (October '00) = Norton lost to Steve Williams. - NJPW Osaka Dome (April '01) = Norton lost the IWGP Heavyweight Championship to Kazuyuki Fujita. - NJPW Wrestling Dontaku 2001 (May) = Norton was beaten by Don Frye. - NJPW International Center (October 28, '01) = Norton & Super J defeated Yutaka Yoshie & Danny Devine. - IWGP Tag Title Tournament (March 8-24, '02) = Norton & Super J lost in the first round to Giant Silva & Giant Singh. Masa Chono & Hiroyoshi Tenzan won the tournament. - NJPW Tokyo Dome (May 2, '02) = Norton & Hiroyoshi Tenzan fell to Shinya Hashimoto & Naoya Ogawa. - NJPW "Fighting Spirit Memorial Day" (May 28, '02) = Norton fought to a draw with Hiroshi Tanahashi. - NJPW Budokan Hall (June 7, '02) = Norton & Masahiro Chono defeated Kenzo Suzuki & Hiroshi Tanahashi. - NJPW International Center (October 26, '02) = Norton pinned Blue Wolf. - NJPW Triathlon Survivor League 2002 (November/December) = Norton, Rick Steiner & Shinya Makabe competed in the league, which was won by Manabu Nakanishi, Osamu Nishimura & Yutaka Yoshie. - NJPW Budokan Hall (June 13, '03) = Norton defeated Blue Wolf. - NJPW Green Dome (July 21, '03) = Norton lost a "No Pinfalls" Match to Josh Barnett. - NJPW Masa Chono's 20th Anniversary (November 3, '04) = Norton, Manabu Nakanishi, & Don Frye beat Shinsuke Nakamura, Yutaka Yoshi, & Blue Wolf. - NJPW Prefectural Gym (December 11, '04) = Norton, Mitsuya Nagai, & Black Strong Machine fell to Takashi Iizuka, Yutaka Yoshie, & Blue Wolf. - NJPW New Japan Cup '05 (April) = Norton lost in the first round to Yutaka Yoshie. Hiroshi Tanahashi won the tournament. - NJPW Sumo Hall (March 19, '06) = Norton was pinned by Giant Bernard. - NJPW New Japan Cup (April '06) = Norton lost in the first round to Hiroyoshi Tenzan. Giant Bernard won the tournament. - Hustle 23 (June 10, '07) = Norton defeated Razor Ramon Real Gay. - HustleAid II (June 17, '07) = Norton fell to Wataru Sakada. - Hustle 24 (July 14, '07) = Norton, Yoji Antoh, & Giant Voba fell to Razor Ramon Hard Gay, Wataru Sakata, & Genichiro Tenryu. - Hustle 25 (August 18, '07) = Norton & Shinjiro Ohtani lost, via DQ, to Razor Ramon Hard Gay & Genichiro Tenryu. - Hustle 26 (September 22, '07) = Norton, Toshiaki Kawada, & Yoji Anjoh fell to Osamu Nishimura, Yoshihiro Tajiri, & Razor Ramon Hard Gay. - HustleMania '07 (November 25) = Norton pinned the Hustle Frog. - Hustle Matsuri '07 (December 31) = Norton & Giant Silva were beaten by Wataru Sakata & Razor Ramon Hard Gay.